Cheating. That’s what these tyres are, cheating. 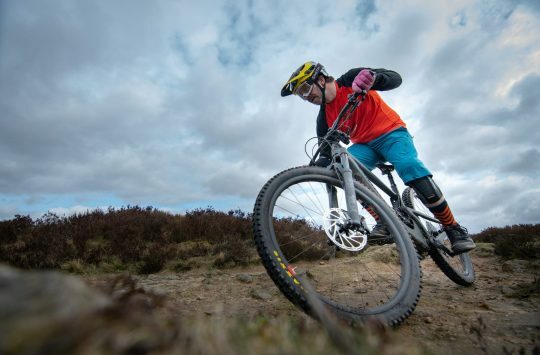 If you’re riding or racing is centred around hunting out the wettest, sloppiest and loosest conditions, and you want to be faster than the clock or your mates, then you need to check out these tyres. It’s that simple. 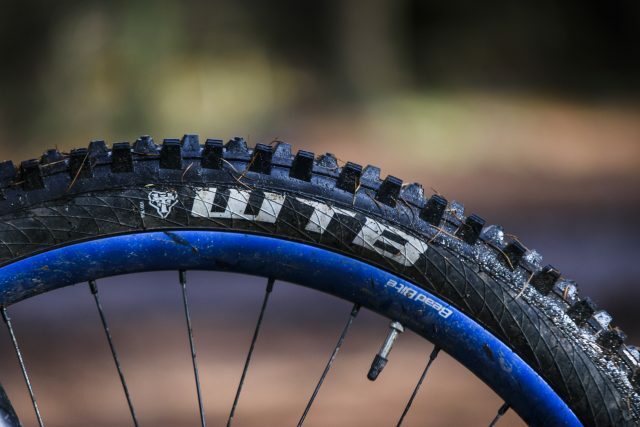 Designed to get you down the steepest and nastiest trails in one piece, the WTB Wardens are mud-oriented tyres that mean business. Available in just two sizes – 26x 2.3in & 27.5×2.3in, the Wardens are built with WTB’s TCS Tough/High Grip rubber compound, with a reinforced tubeless ready casing. 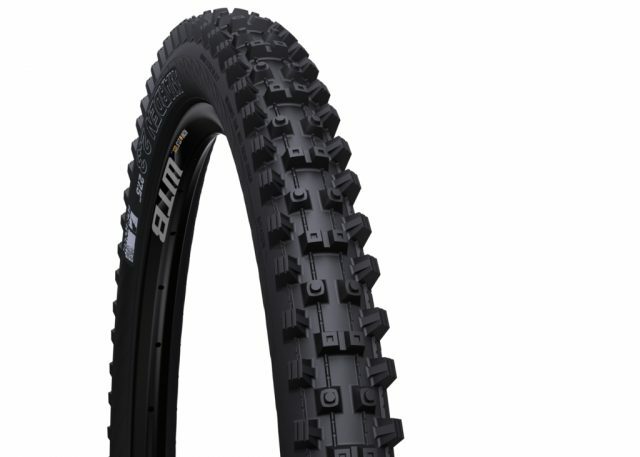 A clean version of the WTB Warden 2.3in wide mud tyre. The ‘TCS Tough’ moniker becomes apparent from the first moment you lay your hands on the tyre – these sidewalls are beefy! On the scales each one weighs in at 1124 grams (1155 grams claimed), but while they’re definitely on the portly side, the bulky isn’t really noticeable once rolling. 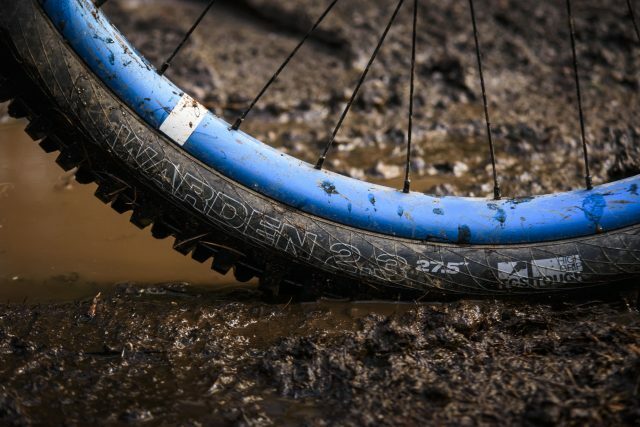 And lets face it, most tyres feel pretty porky when they’re chocked up with sticky mud. 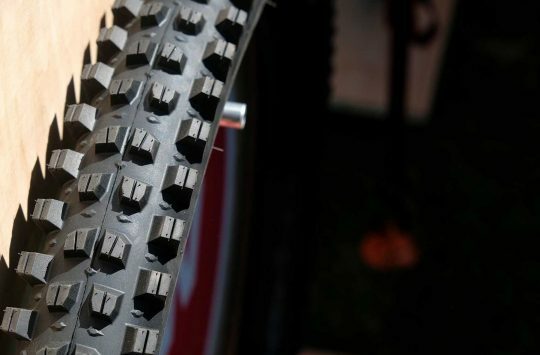 A lot of the tyre’s weight is down to the super tough dual ply casing that does a fantastic job of supporting you and resisting pinch punctures, while the rest comes from the huge siped spikes that protrude, ready to dig deep into the slop and find what little grip there is. Mounting the tyres took a little more effort than some, but once on they went up tubeless with a regular track pump no problem. Mounted on a variety of rims up to a 30mm internal width, the casing is surprisingly small and very stable – they don’t squirm about as much as you would expect, although they are kinda vague on rock or hardpacked surfaces, which is pretty much my only complaint with them. For your reference, I’ve been running between 25-28psi on the front tyre, and 28psi on the rear to support my 82kg riding weight. The Warden’s aren’t particularly high volume, and measure slightly narrower than a comparable 2.3in wide Maxxis Shorty. Another surprising aspect about these tyres is that in spite of the soft compound, they are relatively fast rolling on harder surfaces, as well as being pretty hard wearing – I’ve been running one on the front for over three months now and it’s not showing any signs of wear. The widely spaced knobs clear well and even in the thickest mud don’t clog up. Anyway, enough detail, how do they ride? Well, let me give you some background – within the space of a month and in the depths of winter, I rode several trails around Grizedale Forest on two separate occasions (think steep, loose and sometimes quite daunting trails – those of you who’ve ridden any of the PMBA Enduro rounds there will be familiar with them). The first time, I was riding my regular trail tyres (Mavic Charge F&R), sliding around all over the place and having a blast with my mates, albeit getting slightly frustrated at being out of control on some of the super steep sections. The second time, in similar if not wetter conditions, I had these tyres fitted. Nothing else had changed except that this time, I was in control, with the bike hooking up underneath me, railing corners, and generally giving me an unfair advantage over my riding buddies. Now, I can’t have become that much of a better rider in just two weeks on my own, so I can only put the improvement in my riding down to the tyres. 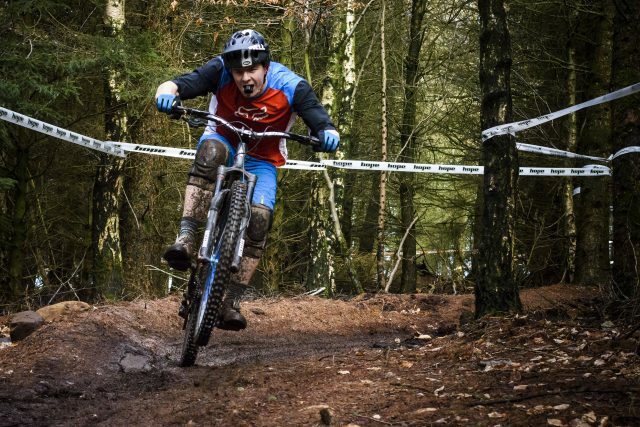 For once, new kit really does make you faster! I appreciate that not all of us are inclined to change our tyres before every single ride so while these are a very specific mud spike, I’ve kept one mounted to the front of my hardtail for the last two months and ridden it solidly throughout the north Lakes. On most trails, it’s as good as the all rounder I took off, on some (wet grass and mud) it’s considerably better, and on a very few (mainly rock slabs and hard pack trails) it’s not as good. Not terrible, just a rather vague and disconnected feeling, leading to a lack of confidence when really pushing it. Then again, the Warden isn’t pretending to be anything but a dedicated mud tyre. To give you an idea of it’s design intents, WTB describe the Warden as the optimal option “when you can’t see through the windshield“. 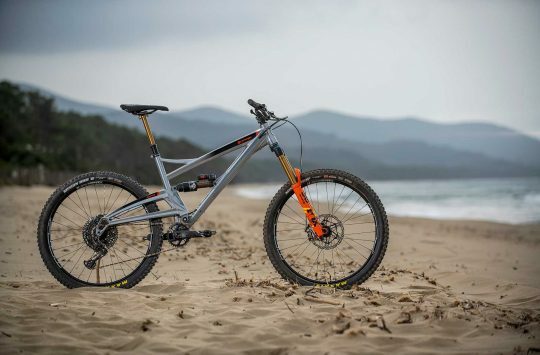 And in those slick, mud-infested conditions where you’re barrelling along downhill with your heart in your mouth, the WTB Warden shines through. 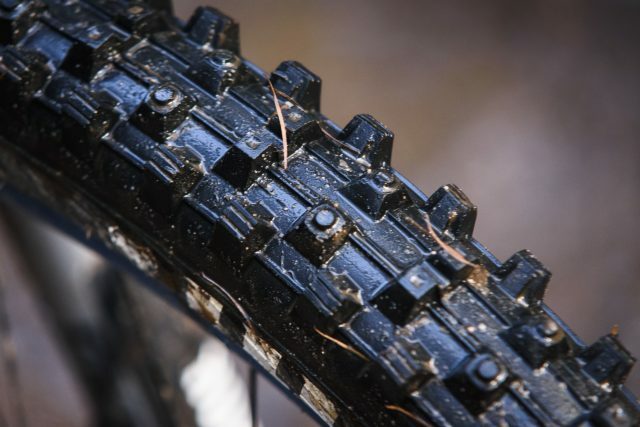 If you’re riding or racing is centred around hunting out the wettest, sloppiest and loosest conditions, and you want to be faster than the clock or your mates, then you need to check out these tyres. It’s that simple (I’m getting a strong sense of déjà vu here).